Israeli Prime Minister Benjamin Netanyahu has taken his fight against the nuclear deal with Iran a step further, appearing on three US talk shows in attempt to persuade the audience that the agreement struck is “bad” and a “better” one is needed. The Israeli leader took to the US airwaves on Sunday to once again decry the preliminary nuclear agreement announced days ago in Switzerland and set to be finalized at the end of June. AP reports that Netanyahu had been using a set of freshly developed talking points drafted by advisers over the weekend. The interim deal dictates that international sanctions be lifted if Iran meets its commitments to roll back its nuclear program. The International Atomic Energy Agency would conduct regular inspections on Iranian nuclear facilities. Netanyahu, however, believes that sanctions should be ramped up not rolled back in order to pressure Iran until it halts its “aggression in the region.” He also expresses doubt about the efficacy of inspections. He added on NBC’s Meet the Press: “I'm not trying to kill any deal. I'm trying to kill a bad deal." The White House defended the US stance on Iran against Israeli criticism, with President Barack Obama calling the agreement a “once-in-a-lifetime opportunity”, as he reiterated US support for Israel in the case it may come under attack. Obama's message was also addressed to US lawmakers, as Republicans in the Senate pressed for Congress to be allowed to vote on the final deal between Washington and Tehran. “Look, the president needs to sell this to the American people, and Congress needs to be involved,” said Senator Bob Corker, chairman of the Senate Foreign Relations Committee. The committee will vote on legislation on April 14 requiring Obama to submit a final nuclear agreement to Congress for review and approval. Last month, Netanyahu raised the hackles of the administration after accepting an invite from Republicans to address US Congress urging lawmakers to stand up to the White House and stand strong against Iran. Democrats considered the move a violation of Capitol Hill protocol. One of the Senate’s most prominent voices on foreign affairs, Democrat Dianne Feinstein appeared on CNN with harsh words for the Israeli leader as he made the talk show rounds on Sunday. Professor of International Law at Georgetown University Daoud Khairallah told RT that although Israel will mobilize all resources to try and derail the nuclear deal, Washington and its allies in the Middle East will eventually have to adjust to a new reality. “They had made an environment of tension in the Middle East based on vilifying Iran and creating an Iranian scarecrow and nuclear threat to the whole world. 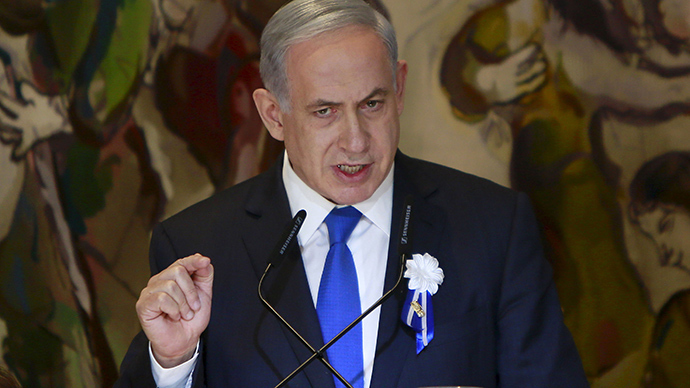 Whereas Israel sits on a huge pile of nuclear weapons,” he said.